Salt-free, sugar-free and delicious! 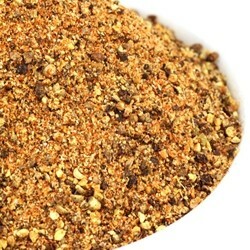 One of our most popular blends—gotta like black pepper! Excellent as a dry rub for steak and roasts. It's nice on your dinner table to sprinkle on just about everything! Black pepper, granulated onion, granulated garlic, celery seed and sweet bell pepper. 2 ounces packaged in a resealable bag. This is absolutely one of our favorites. We can't be without this one! I never even liked pepper until I tried this. I now put it on my salads, on my sandwiches and anything else I'm making. A little goes a long way and it is amazing. My boyfriend has always used alot of pepper and this is now the only one he uses. Click here for our Shredded Potato Kugel Casserole recipe! Click here for our Zucchini Carbonara with Shrimp recipe!